Currently, China’s economy is largely based on an manufacturing-age mindset. This mindset causes the work flow of a product development organization to resemble that of the old assembly line. Everyone is responsible for one task and is rewarded for successfully doing just that. When that task is completed, it is passed on to the next person. Design is just one function in this linear process where collaboration and teamwork is a foreign idea. The product manager writes the specification and gets a design resource to finish “drawing up the concept”. Despite the current situation, I believe that Chinese companies will join the rest of the world in the Experience Economy sooner than we would think. The Chinese economy have been growing at rate that many of us can’t ignore. The government, while still politically far removed from the world, is committed to growing the economy at GDP rates in the teens on average. Thus, Chinese companies will realize, like their Western counterparts, that Design thinking will need to be core to their organizational structure. 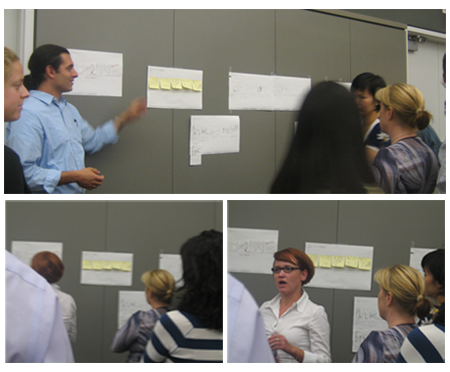 On October 25, I helped the IxDA NYC group put together an event we called “IxDA Studio”. The concept of the event was to bring together experts/design masters working directly with a group of design professionals in a studio/crit setting (like back in design school!). We wanted a place to design together outside of work and to learn new ways of approaching problems from our peers as well as from seasoned design masters. We found ourselves 2 masters to help us: Josh Seiden, Design Manager at Liquidnet and Ted Booth, Interaction Design Director at Smart Design. 6:00 PM people arrive, eat pizza and chat. 6:15 PM – Josh and Ted gave the team the design challenge and brief (design a resource center for the IxDA site). 6:30 PM – Teams of 3 designers went to their own corners to tackle the problem. They were asked to spend an hour in groups of 3 designing. The deliverable we asked for at the crit is a concept statement with some sketches that shows the concept. 7:30 PM – we gathered together for a crit. Each team had 10 minutes to present the concept and receive feedback from the mentors – five minutes each. So what happens when you put 30 interaction designers in a room, some pens, paper, and a design challenge? Some of them come up with concepts they describe as “semi-permeable membranes”. Those with an engineering edge will give you patentable technologies like “the magic filter”. Some complete and well thought out web solutions; intriguing concepts that challenge the definition of this thing we call a “site”; and what happens when Yelp meets Kayak with a dash of fluidity? You also get a lot of laughter and a lot of useful learning experiences we can bring back to work. Basically a lot of fun and magic happens in three hours. Let’s take a look at collaborative dynamics of these groups in action, their presentation and what happened at the crit. Team 1: Faith, Bianca and Kate gave us a very strong start for the crit with really great thinking and creativity. Their design concepts were inspired by a set of design attributes driven off of the client’s brand identity – turning constraints into creative vision allowing them to push boundaries. You can see in their concept sketches below that they didn’t go for the traditional “web page” design. Team 2: Harry, Laura and Nelia started off with a big statement, “the absolute is… there is no absolute.” They also gave thought to the different user groups of the site and defined their needs from a resource center. They used a set of key words to help them hone in on a concept: compelling, flexible/scalable, relevant/current, intuitive/transparent, open/collaborative. The functional requirement was that it has to allow for variable levels of engagement. They came up with a solid site design and architecture under an hour. Team 3: Bryan, Carol, Cassandra and Xu focused on visualizing the information of “resources”. 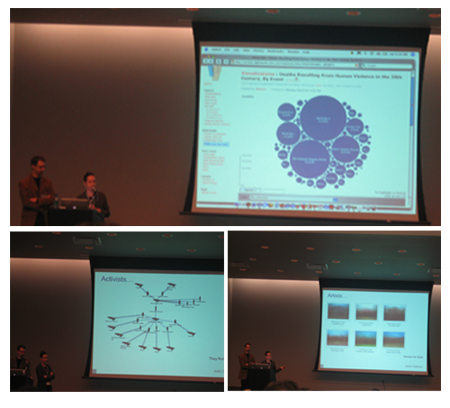 They used tag clouds as a thinkmap to explore the relationship of information bottom-up. They want the metadata to be nominated letting the community rank content, hence “curating” what gets bubbled up to be seen by all. Team 4: Eduardo, Pauric and Ray pitched the “magicability of their filter” that will treat everything as a resource and organize by tags, authors and a very fancy taxonomy. They basically have the whole site architecture figured out. So IxDA board members, you know who to call if you ever want to build a Community Curated Zeitgeist. Maybe they will even be nice enough to let you use their patented “magic filter” for free since it’s for a good cause. Team 5: Andrea, Masha, and Micah gave us yelp plus kayak and a dash of fluidity. This group was definitely a good example of how clear thinking gets you to a very simple and elegant solutions. Ted pointed out that they were the only group to talk about what is a resource and what is not a resource. Having clarity around the nature of the information lets them focus on the design. Their concept was about helping people find information in the most fluid way possible. Amazing what 3 designers can figure out in 1 hour! Team 6: Karen, Pablo and Nick had a very methodical approach that got them to a very complete solution that combined some traditional web layouts with some jazzy browse and search concepts. They came up with 4 themes and 3 behavior patterns as design guidelines. 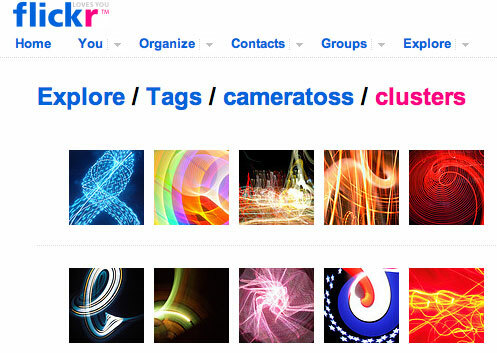 4 themes: accessible, live (community), fresh and relevant. 3 behavior patterns: the browser, the searcher, and the passive observer (someone who waits for the community to tell them what’s popular). Started out with user and purpose with some brand attributes got them to a very elaborate solution in just one hour. That good old interaction design trick really works! Team 7: Lily, Emily and Donghwan focused on connecting people rather then just the content. Emily (perhaps a former biologist or maybe she’s just one of those designers who knows everything) called the concept a “semi-permeable membrane”. Focusing on the people got this group to push some interesting boundaries. They put this out there: perhaps, ultimately people are resources, people who are interested in the same things perhaps should know about one another in the community, and exposing what people know would make them a resource to the community and to those with similar interests. They also drew ideas from Johnathan Harris’ work with the Yahoo Time Capsule in some of their visualization concepts. Team 8: Bruce, Lisa, Melania started off with “it’s all about me”. They visualized the content, the site, IxDA and all of the “things” around “me”. Putting the user in the dead center of the concept resulted in a design that looks outwardly from the user’s own page, kind of like a IxDA Myspace page. This design gives people a reason to put effort into doing things like tagging, organizing and creating “resources” for the larger community to consume. The night ended right on time. The audience was very respectful, they listened well, and were eager to hear what the design masters had to say. Ted and Josh did an amazing job with the crit. They asked very good questions that pushed the design teams to think more critically about their concepts. They pushed where there is room to push. They also pointed out good techniques and approaches so the rest of us can learn new things to try out when we get back to work. We think that this is an event we would like to repeat and if other local groups wants to do this and need help with logistics. Please get in touch with me at liya.zheng (at) gmail (dot) com. Fore more photos from the evening go to Flickr. Nate Burgos asked me to do this interview, check out his site Design Feast. It’s got some really extensive listings of design links. Lately, I’ve been giving a lot of thought to what’s next for me in my career. So I’ve been doing a lot of research. That quest took me through a lot of random subjects that I think someday I can stitch together into one meaningful career path, some of my research are in these areas: social entrepreneurship, service design, design strategy, social and economic problems in China, India, Africa… All because I want to be make my design practice socially conscious but I didn’t know what that really meant. This quest got me into some interesting things and meet some cool people. Tonight I met Tom Igoe from NYU’s ITP (Interactive Telecommunication Program) and Jennifer van de Meer from O2NYC at Tom’s Sustainable Practice class. I have invited them to a panel I am organizing for the IxDA on Eco-Interactions (no final name yet) panel that will take place on January 24th, 2008. We, experience/interaction designers, if think about our projects from a service mindset, we are better set up to be ecologically responsible in our work. The reason is that, when you only think about designing products, you can only think about the materials, manufacturing and perhaps even the reuse-ability of that product. A lot of times, the waste happens during distribution/transportation, use/reuse/maintenance phases of the product’s life-cycle. With a service mindset, you approach the problem from a different angle. 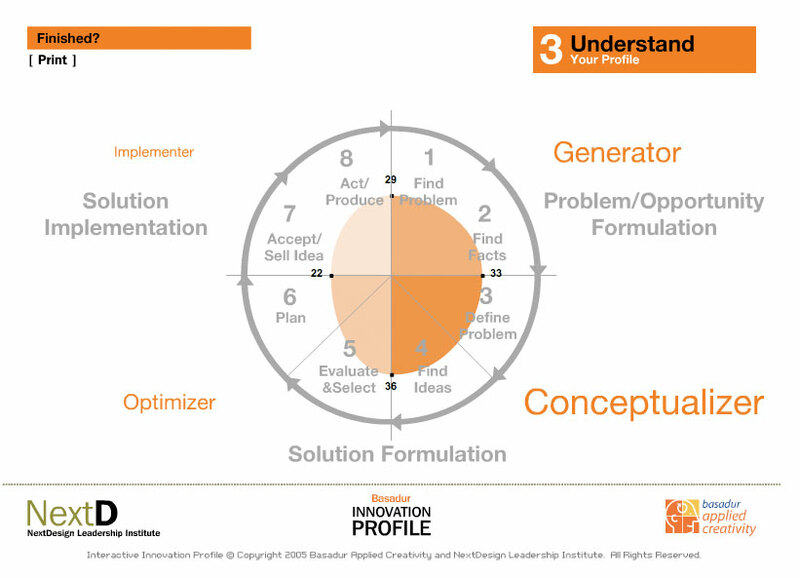 You dig deep into people’s problems and pain points and really understand them in the context of the product problem. You try and understand where business costs are incurred for your client. You put those two together and try to solve the problem with a service mindset. Think about how to appeal to consumers and business with a complete solution that goes beyond the product itself. And a lot of times, minimize the use of a product by delivering great service. Lifecycle analysis shows you, for any given products, an inventory of environmental damages the product may cause in its life time. Unfortunately, if you look at these stages of the life-cycle, you will realize that American companies have outsourced to countries like Taiwan and China where regulations can be a lot less strict that the U.S. or Europe. educate ourselves on the subject constant and seek out experts to help us in these issues, dig into the facts. use our skills in visualization, web, graphics to educate people in engaging ways. find engaging/clever ways to incorporate into our designs things that help raise people’s awareness or make them inherently more sustainable in their daily lives. influence corporations we consult with to not just green wash but really make a difference by finding ways to design better products and services with less environmental impact. Help them realize that though sometimes it’s a bigger investment to be socially responsible, a lot of times it can be innovative and cost saving. The more of the latter we can show, the more impact we will have. 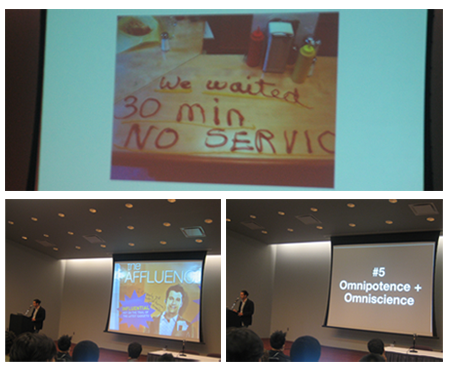 Emergence was all about service, what is service design? A service mindset means designers need to give up control and empower our customer. Facilitate their engagements beyond products and interactions. Designing for services is a mindset, most products we design are part of a service if you look deep enough. Providing good services requires designers to collaborate and enable others to think on their own, grasping every key moment to deliver to the customers above and beyond. Designers need to stop making crap and start helping people help themselves. Designers need to speak the business language and be stealth. A service mindset means more facilitation and more stratetic business thinking, which is not traditionally a designer’s job, we have to step up to it. Manyeyes was conceived as a research project to research how information graphics used in a social network context will have effect on people. Go to the site and see for yourself what effect they have on you and notice the comments others have left. This is really a cool project. This is my latest interest, what motivates people in different cultures? Mark presented a case study on a project they did to redesign the service of a health insurance call center. The methods they used to help their client involved doing observations, domain study, working with stakeholders, experience maps (“the health journey”), workshops on finding a focus (“be clear about your role: guide? teacher? coach? expert? financial advisor etc…”), scenarios, personas. They did experience prototypes and acted out scenarios in workshops with the client. They also delivered a set of service design principles for their client as a deliverable and a prototype (fictional call to show how a the specialist can seize key moments with the customer. As a result of this project, the client had a create a whole new role in their organization. They also have had to change the way they measure success, prior to this project, they measure how quickly the reps can get off the phone. Now, they don’t. It’s amazing to me the kind of organizational change IDEO was able to make here. 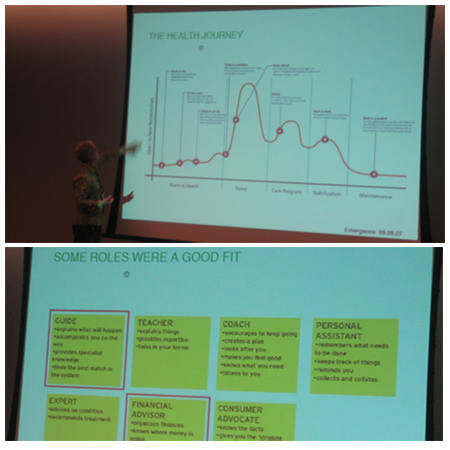 Todd adapting Peter Merholz’s path, gave a more theoretical talk about how to stop designing products. I think his whole point was that Service Design is a mindset rather than a brand new discipline with totally new methods and techniques. Service design examples he mentioned were: Apple, Flickr, the old tale of Eastman Kodak. Here is something he wrote on the matter. I tend to agree with most of his points. When we design with a service mind-set, we have to look at goals, cultures, relationships and understand people completely, in order to bring to them magical moments in all their experiences with our systems they interact with. 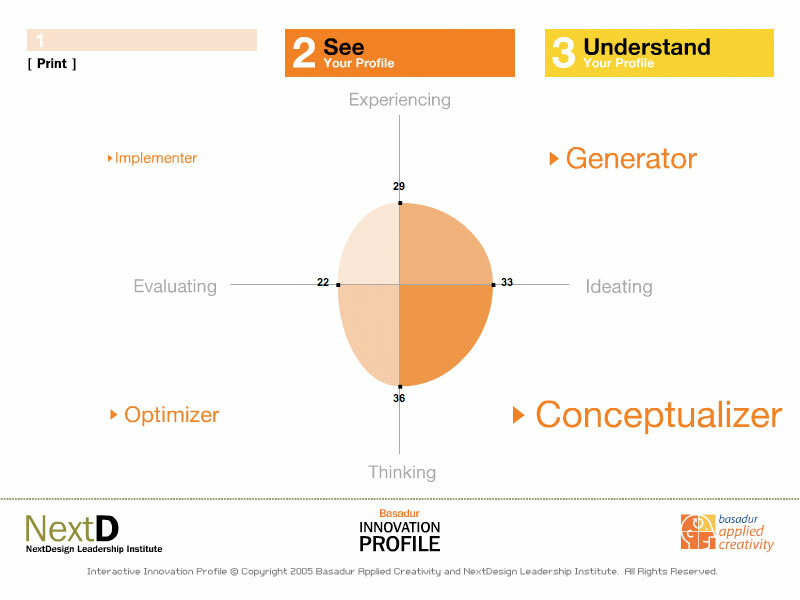 What is service innovation and design? Hey Interaction Designer! Are you a rocket scientist? I was having dinner with some friends, we inevitably came across some pretty geeky topics: recursion, evolution and relativity were amongst them… To make it more interesting for me, I drew analogies to my work in my mind. The techniques that Turin, Darwin, and Einstein all used to help them arrived at their world-changing scientific discoveries and theories are the ones core to our Interaction Design work. Maybe “design is rocket science” after all? Well, I haven’t figured that out yet, everyday passes, I feel differently about it. Turing, the father of computing, whose work led us to early computing theories like recursion and eventually led to progress in artificial intelligence, used the simplication method to design his Turing Machine studies. Interaction Designers are often faced with trying to answer deeply complex problems. Like Turing, we have to rely on the method of simplification as a way of problem solving. When we are handed a problem, they are often accompanied by a lot of opinions, conjectures, solutions; we are handed documentations written by stakeholders, SMEs, and even customers themselves. We read and listen to all of them, and we have to distill all of that into a very simple problem definition in order to help everyone see clearly what really is the problem that we are trying to solve. My experience is that when we can do that well, we provide a clear vision for a product beyond the design work. And that is when we get to sit in on strategic level conversations. Thus, this ability can help us make huge changes in places we work. 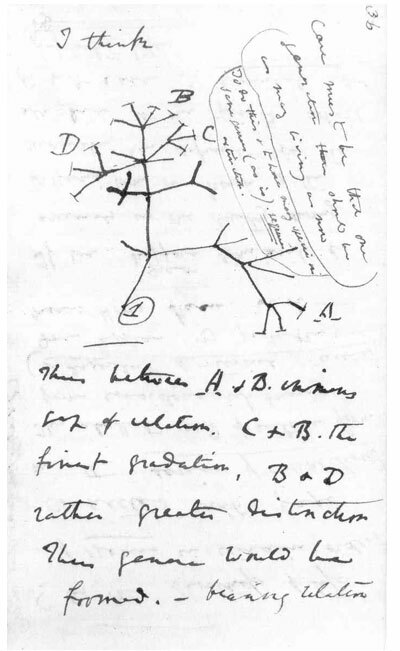 Darwin, the father of modern science, began his scientific inquisitions with observation in the field. Like modern day designers and scientists, he spent time in the field. He attentively saw everything around him and let nature be in control of guiding him to answer questions and to raise questions he didn’t know to raise. “The Beagle survey took five years, two-thirds of which Darwin spent on land. He carefully noted a rich variety of geological features, fossils. At intervals during the voyage he sent specimens to Cambridge together with letters about his findings, and these established his reputation as a naturalist. His extensive detailed notes showed his gift for theorising and formed the basis for his later work. The journal he originally wrote for his family, published as and living organisms, and methodically collected an enormous number of specimens, many of them new to science.The Voyage of the Beagle, summarises his findings and provides social, political and anthropological insights into the wide range of people he met, both native and colonial. In a business world, we are taught to focus on figuring out the problem and coming up with a solution with as little time as possible. Designers can find themselves in situations where their stakeholders and those who pay for their work do not appreciate observational research. It’s not just business people, I have even worked with people who are UX professionals who did not have that appreciation. When you are asked to find out questions to a fixed list of questions, you may be motivated to just do that. Well, don’t! That prevents you from doing great things. If Darwin had a preset of questions and only followed them, the world will be a different place today. Noticing things while we are out in the field is probably one of the most important things a designer can do for his/her own work and for organizations that pay them. When Einstein was solving the relativity problem, he had a hunch about something – “the speed of light is constant”. While it was just a hunch, he was willing to let it lead him for a while on this scientific inquisition and see where it would take him. This flexibility in thinking ultimately led him to the theory of E=MC2 and his theories changed the world we live in. Often, when we conduct user research we get these inexplicable hunches – be it some new inspiration, a new idea about the customer behavior you can’t quite articulate and have not enough evidence to back up, a design idea that is premature… If you pay attention to these hunches and let them pull you a bit in your research, they often help you form powerful inspirations at the end for solid design concepts. Be flexible in the field and let your observations guide you instead of the list of questions your team came up with before you started the research. Because once a problem is better understood, the list of questions you started off with will no longer be relevant. Because as you observe and listen to your customers, they tell you things you didn’t even know to ask. Simply, if you get a hunch about something, treat it like an information scent. Tirelessly pursue it. Pay attention to it and keep following your instincts. Keep inquiring about it. Notice it in the environment, in conversations, in artifacts, in the way people express their needs, desires and emotions… As you keep paying attention and letting yourself connect, this connection will eventually serve as the ground for your design. It will help you inspire others. When I let myself do research this way, I come up with designs that have cores. Designs that don’t break. Once you put a core in your design, it is like the personality we develop as children; it’s not something people can easily change. When a design doesn’t have a core, it breaks easily when people question it or when they want to add things to it. The personality you develop as a child stays with you no matter how much you’ve been through, it’s genuine to you, it makes you you. A design that has a core will not be frankeisteined when it grows — all products grow, you can’t help that — but you, the designer can help it grow healthily and beautifully by first providing it a core. I started to realized the powerfulness of hunches when I had an experience working with someone who doesn’t work this way. When I expressed my hunches, I was questioned, and when I couldn’t back up the fuzziness, I was discouraged to keep pursuing them. I couldn’t convince my team to give up the list of questions and let the evidence lead us. Well, due to my own inexperience, I thought maybe this other way is a more certain way, so I went with their method. Later on in the project, I realized that I should have pursued my hunches because though I managed to give the design as much integrity as possible by articulating the business and user needs to back up the concepts, the design had no core. I know now that it is something that will cause us problems later as the design grows. Certainly, that happened before we even got out of the concept phase and the concept phase dragged on and on. Simplify problem definitions: problems are complex, simplify them, your solution will follow in that course. Observe and follow scents: when you are out in the field, observe the environment, listen to what people say, follow the information scent they are trying to give you. Put your subjects in control of delivering you questions and answers. Trust them, they will lead you to find what you need to know, not a preset fixed list of questions. Follow your hunches: following your hunches will lead you to ask questions that helps you get to a good design. This allows you to give a core to your product, allowing it to grow elegantly. NextD and Basadur teamed up to bring us an innovation profiling tool. It is developed to help organizations better understand all the innovative talents they have in house and better assemble teams to leverage those talents. It costs $12.50 to take. I took it to see whether it’s actually worth the money (probably not the best way to spend money). But hey, now you wouldn’t have to unless you are REALLY curious! To find out more about what’s behind this, go to Basadur’s website.